Carmen Adriana stands for Style, Clarity and Confidence. She has spent 15 incredible years curating powerful looks for some of NYC’s most notable personalities. She specializes in helping leaders create images that communicate exactly who they are to the world and what’s more, she makes it easy! Carmen also believes in having lots of fun! Her approach is honest but never judgmental. Appointments are relaxed and focused. Clients are instantly at ease, happy to put their trust in Carmen to bring out their very best. Carmen has served as wardrobe consultant for the premier talent on Bloomberg News—many of whom were featured on Business Insider’s Best Dressed List. Her clients include recognized names like SNL’s Kate McKinnon and OITNB's Alicia Reiner, The Insider’s Lloyd Boston and CNN rising star Laurie Segall, She’s been privileged to work with icons such as Christie Brinkley, and the late Michael Jackson, and has styled projects for Hearst Publications, the NFL, “White Collar,” and “Full Frontal Fashion”, to name a few. Carmen has also recently been named Brand Ambassador for the Michael Kors Southampton Boutique where she hosts monthly exclusive personal styling events. 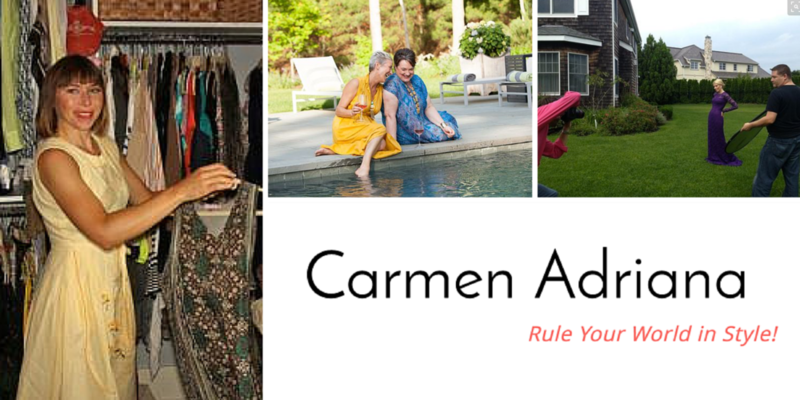 Carmen has enjoyed invitations to speak her unique wardrobe language at top real estate firms, prestigious Guild Hall in East Hampton, even the Army! To round off her experience, a full roster of executives and entrepreneurs rely solely on her as their style guide. Community involvement is key to Carmen’s sense of well being. She delivers Meals on Wheels, and is the founder of ToastHampton, the first Toastmasters International charter on the East End of Long Island. She spends her spare time working in her organic vegetable garden and knitting cozy things for her loved ones.